Eager to try a summer sport, Lucy and her friends meet at the soccer field for their first game of three-on-three! Thanks to Coach Nick, Lucy and the rest of Team Blue learn a few basic skills as they prepare to face Team Red. This is the third book in the Lucy Tries Sports series, designed to encourage children to get active and participate in sports. 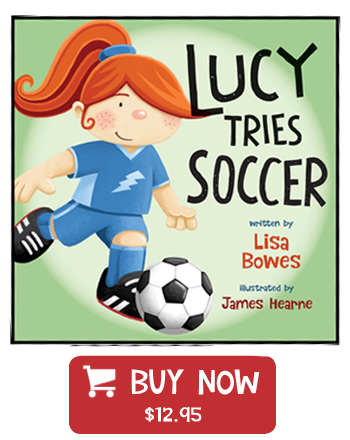 In Lucy Tries Soccer, Lucy discovers how much fun it is to play on a team and learns why soccer is the world's most popular game. The Lucy Tries Sports series reinforces the HIGH FIVE principles of healthy child development needed for quality programs, including the support of a caring adult, the opportunity to participate, to play, to make friends and to master skills. Also available, Lucy Tries Luge, Lucy Tries Short Track and Lucy Tries Hockey.